Earthworms are highly prized by gardeners and composters for their ability to process organic material and enrich soil with nitrogen and other nutrients. And although there are more than 4,000 different worm species, all are categorized into three types, anecic, endogeic and epigeic. These words refer to where the worm lives in conjunction to how they eat. All worms, despite their dwelling and eating habits, benefit the earth, process organic matter and increase the soil. According to the Colorado State University Extension Service, anecic worms includes earthworms that build permanent burrows in the mineral layers of the soil. They then drag organic matter from the soil surface into their burrow to be used as food. These worms include common fishing bait worms, as well as nightcrawlers and dew worms. These worms eat ground liter as well as soil and grow to be between 8 and 15 centimeters long. Endogeic earthworms refer to worms that live and feed in the mineral soil, as opposed to feeding or dwelling at the soil surface. According to the Great Lakes Worm Watch, produced by University of Minnesota’s Natural Resource Research Institute, endogeic earthworms ingest mineral soil and digest the organic material and microorganisms from it. “They rarely feed at the surface, but may be found under logs and rocks and are often seen at the surface after heavy rains when the surface moisture makes it possible for them to disperse without drying out,” the site states. Endogeic worms range in size from 2 to 12 centimeters and have no pigment. 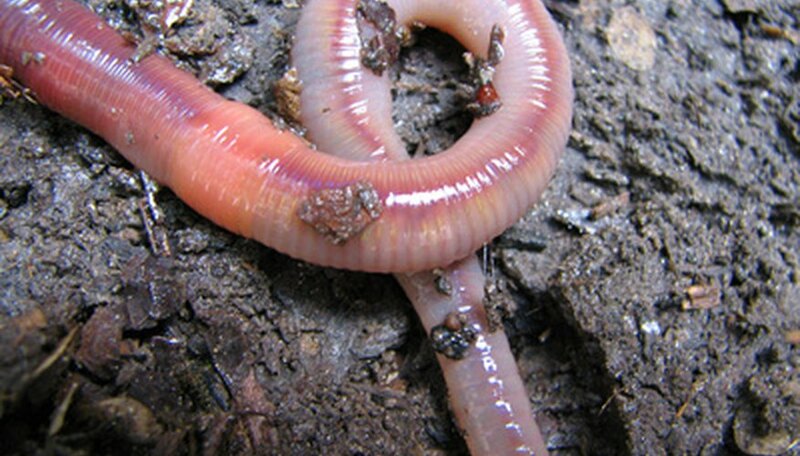 Epigeic earthworms live and feed on the surface of the soil. The Compost Bin, an organization dedicated to recycling organic waste, asserts that epigeic worms are commonly used in vermicomposting, which is composting that utilizes surface worms to process compost materials quickly. These worms have poor burrowing ability and prefer to live in loose topsoil. These worms are generally small, ranging in size from 1 to 7 centimeters and are reddish in color. Epigeic worms are commonly referred to as red worms, manure worms, brandling worms, red wigglers or compost worms.